Step 1: Take 1 whole chicken and cut into 4 large pieces. 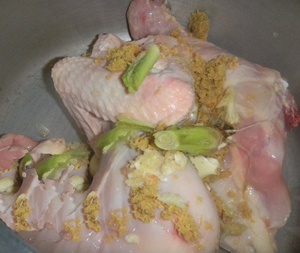 Remove the skin and fat.Put in a pressure cooker and add 1 tablespoon(tbsp) of ginger , 1 tbsp of garlic, lemon grass shallot cut and slightly crushed and salt and 4 cups of water . Cook it in the pressure cook for 15 mins to make the chicken stock and cook the chicken until it is tender. Step 3 : While your chicken stock and lentils is getting cooked, get your coconut milk ready. If you are lucky and can get fresh coconut milk, that is even better, but in Kathmandu, I have to make do with instant coconut milk that u get in packets ( The taste is pretty good ! ) Mix 3 tablespoon of coconut milk power in 1 cup of hot water to make 1 cup of coconut milk. You need 2 cups of coconut milk for this recipe. Step 4 ~ Get your lemon grass twig ready. Take the whole leaf and root and just winds it together into a knot. In a big dish, mix the lentils , the chicken stock and lemon grass and 3 cups of water and cook for 10 mins.Add the chicken cubes to the broth. Meanwhile, shred all the boiled chicken and add it to the lentil and chicken stock. Then add the coconut milk and cook for aother 5-10 mins. 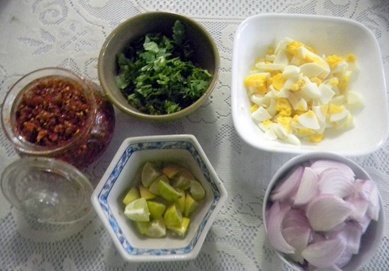 To give it a rich lemon grass taste, I normally add 1 tablespoon of ready made TOMYUM paste. but this is an optional item. Finely slice 1 large onion and fry it in 2 tbsp of oil. When it become soft and light brown, switch of the gas. Add 1 teaspoon of coarsly grounded chillies and mix. Add the fried onions and chillies to the soup mix and cook for 5 mins. If the soup is too thick, then you can add some water. Check the salt to your taste. The soup base is now ready. 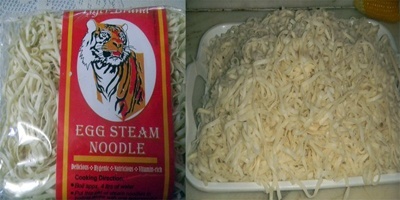 Get any type of egg noodles or even rice noodles taste nice. We love flat noodles but you can use round ones too. Cook them in hot water as per the instructions on the packaging and drain and set aside . Step 7 : Get all your topping ready. Pour the hot spicy chicken soup on top and finally …….. DIG IN !!!!! 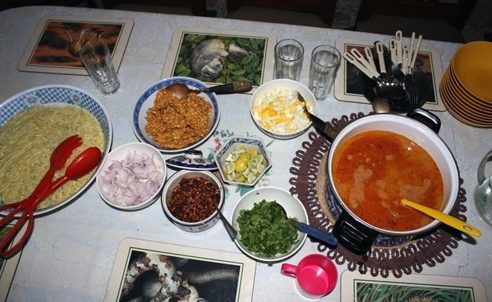 This entry was posted in All Recipes, Chicken and tagged Burmese soup, chicken soup, noodle soup by Kamakshi. Bookmark the permalink.